Made my way to 'Rose Morris' in Denmark St, to buy some Tympani Sticks for a few QSP songs. I then made my way to Brent Cross to get my mobile phone fixed, I also found a hardware store nearby to get tape for my drumsticks. I met Andy at the Radisson and we went to eat together. In my hotel got locked out of my bathroom with the shower still running! I had to get dressed and wait for the maintenance man to open the bathroom door. I met Andy for breakfast before we drove to ‘Stag’ rehearsal studios. Suzi arrived with Dionne and Louise (our backing vocalists). Jez, our keyboard player, arrived spent all day going over the Australian set. We all went back to, Suzi’s to get ready to go and eat. Came back to her house, sat around chatting before I went to bed 23:00. I was up at 07:15. Cleaned up and relaxed downstairs with some tea. We all had breakfast together before Andy and myself drove to the rehearsal studios. We spent all day rehearsing the Australian set. A GREAT DAY. Hopefully we are all ready! We’ve got a set worked out. NO DOUBT, that will change once we get going…..
Dave Hill fit again - back to doing gigs - gig at Butlins, Skegness. I was up at 09:00. Met, John Rossall from the 'Glitter Band' we had a little chat before I made my way to 'Centre Stage' where we were to play that night. I then went to Centre Stage (where we were playing) to sort my kit out.... Spent all afternoon there. I went with, Tim and Robin to the gig to sort my drums out before we did our soundcheck. We did our check first as, Sweet would be opening the show…. 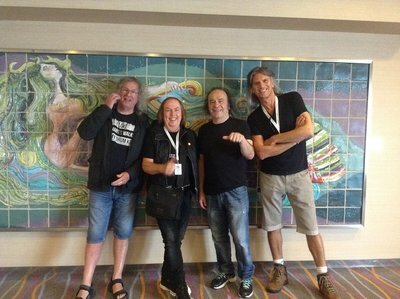 Andy Scott and myself spent a while reminiscing about Australia as this was the first time I’ve seen him since we returned home…. We had a, great show to about 2,000 people. Our good friends Malcolm and Fran were there from England…. 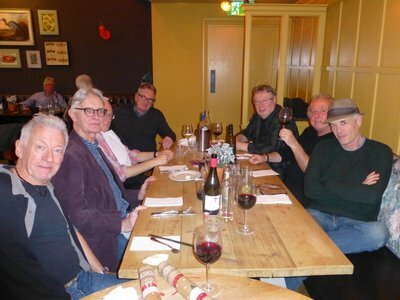 Ilpo Bister was there from Finland with two friends… And also our great friend Bernard was there from Munich. Finally a couple from Vancouver, Canada were there too. The guy's wife surprised her husband with this trip for their 25th Wedding Anniversary. They used to see our concerts in Canada back in the 70’s…..Also a lot of our dear and loyal Danish fans and friends were there. 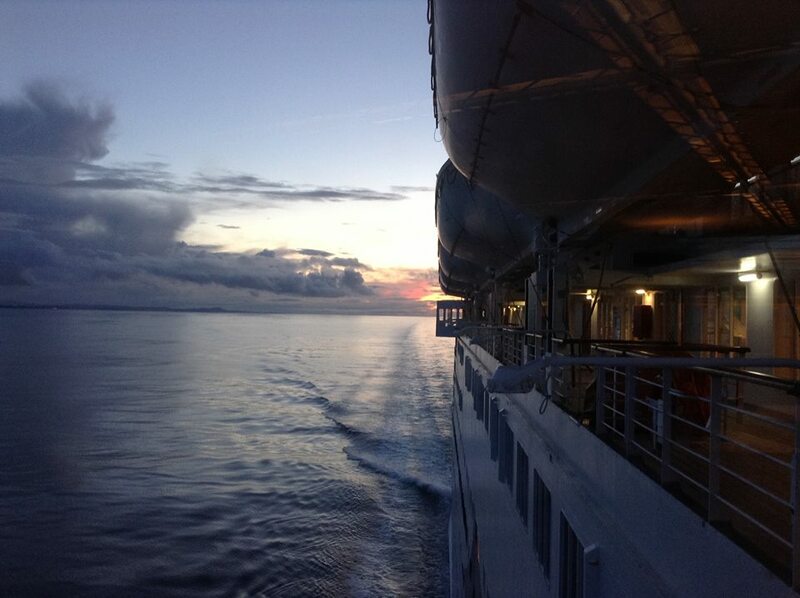 It really warms my heart that people are SO VERY loyal to us, ‘specially, to travel like they do…. We all drove to Nykøbing Mors, about an hour from Viborg….. Checked into our hotel….. 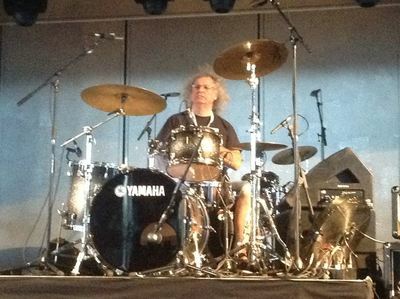 I went with, Tim and Robin to sort my drums out before we did our soundcheck…..
Phil Bate’s ELO were also on. Amazing, at both shows…. How many people had fantastic comments about QSP’s CD and our Australian tour…..
We then made our way to Andy and Jane's place, relaxed a while before making our way to have a look at the gig site. We all went out to eat together and went back to the, ‘King's Arms’ for a few drinks. Drove back to, Andy and Jane's to get a good night’s sleep. Andy, Jane, Hanne and myself all had breakfast together… Bruce, his lady Tina, Tony, Pete, the guys from SWEET arrived. 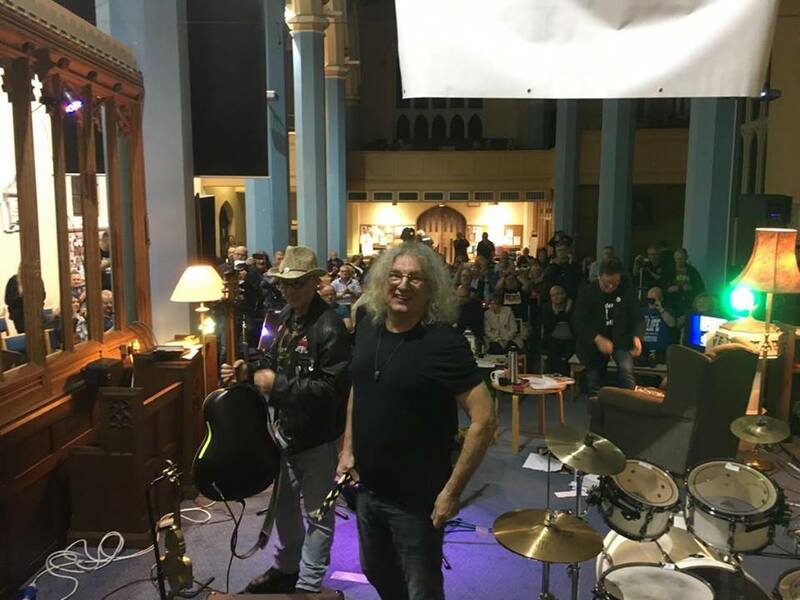 Made our way to the site, Jamie Moses (guitarist who sometimes plays with Queen and ‘trillions’ of other acts) joined us all so we could ‘acoustically’ rehearse the Slade songs I was going to play with them. ‘Mama’ and ‘Noize’ were the choices….. It was a great concert for a great cause…… It was great playing on stage with Sweet and Jamie Moses. 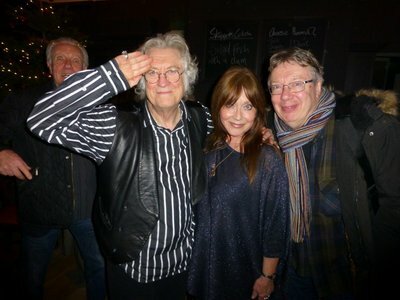 I was in touch with,Terry ( drummer with ‘Colonel Bagshot’ and later ‘Bunny' - signed by Chas in the 70’s)……. Terry met us at Liverpool Lime St station with his lady, Christine. We drove to her house were Hanne and myself would stay. We relaxed before we all ate dinner together… Relaxed and reminisced when ‘Bagshot’ and ‘Bunny’ toured with, Slade…..
Terry and Christine took us to the Beatles museum in Liverpool, Something I’ve always wanted to see…. We were greeted by, Martin King, the head of the Beatles Museum. He called for Dave Milner who took photos of myself in front of the ‘Cavern’ and around the museum also by the new, life size, bronze statue of the Beatles…. Drove to Ringo’s local ‘The Empress ‘it’s near where he used to live. (MANY, MANY YEARS AGO.) AND is the front cover on one of his solo albums….…. Mal McNulty joined us. 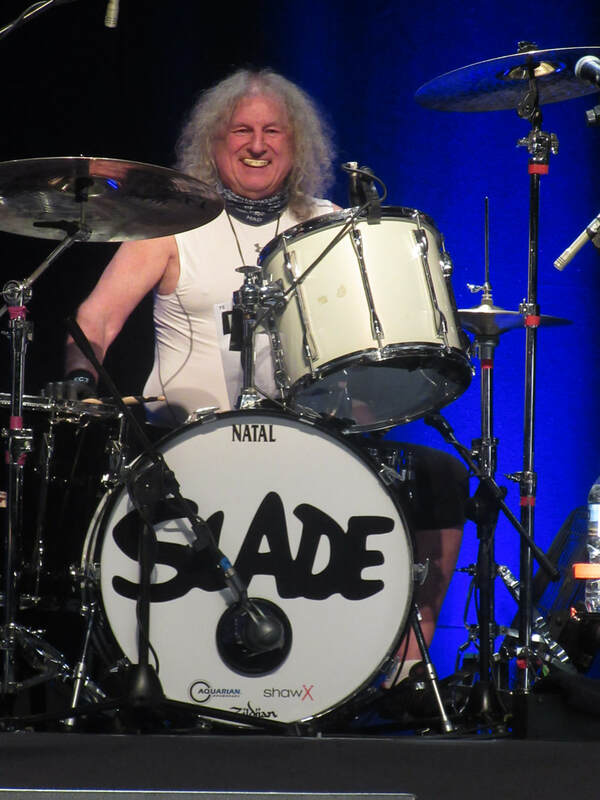 Also, Lou Rosenthal (drummer with ‘Export’ who toured with, Slade on one UK tour), Alan Lynch, one of Terry’s old roadies - who later joined Slade for many tours, I reminded him about the, time he was going to punch Jim Lea out…. Also, Louise, one of Suzi Quatro’s backing singers from our Australian tour together, was there. She was telling Hanne, I used to sneak in to her and Dionne’s dressing room and ‘nick all their sweets…… Freda Kelly, she was the Beatles fan-club secretary during their heyday was there…. She was SO much admired by them all because, she never told any secrets or stories about them to the newspapers for lots of money…. She is still friends with Ringo and still sees him when possible, (Now there is someone I admire). WHAT A FANTASTIC FEW DAYS…. I eventually got to Helsinki after delayed flight and running through Airport terminals to make connections…..….. I was met by a, driver to get me to our hotel, checked in my room and relaxed there, I ate in my room and had an early night. 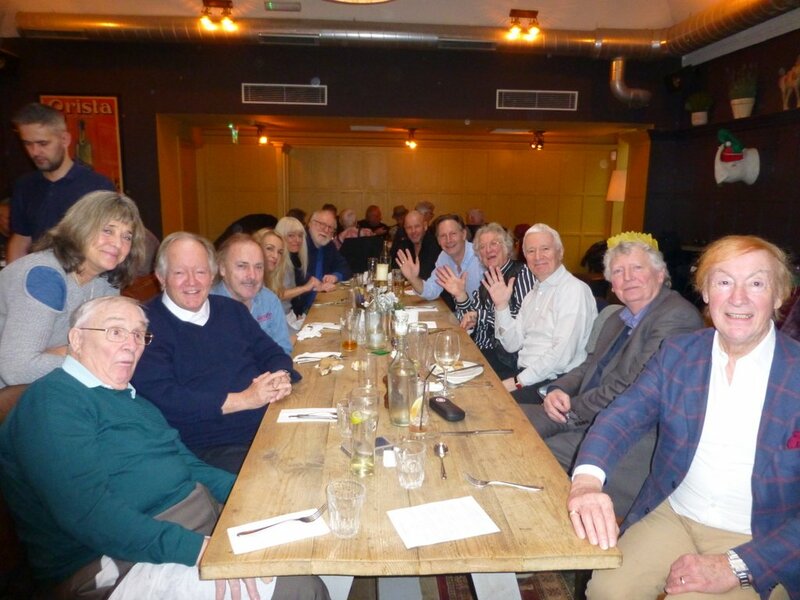 I managed to speak to my dear friend Swinn’s lady as it would have been his 70th Birthday today, No doubt he would have had a big party…..
Would you believe I was in bed by 21:00. Made tea and started to clean up. I went for breakfast everyone joined me. Nazareth and Suzi Quatro were also on the show. Backstage I had a, chat with Jez who was on keyboards with us in Australia. I also had a, great chat with Suzi and Rainer (her husband) mainly about Australia, Great news - the QSP CD is being released in, Europe during September this year. 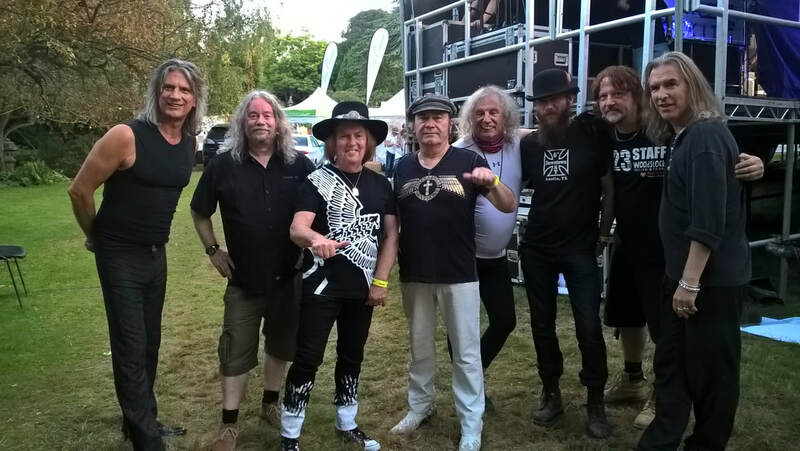 Slade had a great show to about 4,000 people in the ‘Hamina Bastion’ stadium in Hamina….. I also had a great chat with Nazareth before driving back to our hotel at the airport in Helsinki. I was up at 04:45 ????????? Cleaned up and made my way to the West-End. The McDonalds was open on Tottenham Court Rd - I relaxed there with some tea….. It was amazing how many people I passed ‘dossing’ in doorways around there - BUT they all had mobile phones OR Ipads. Mmmmmm. 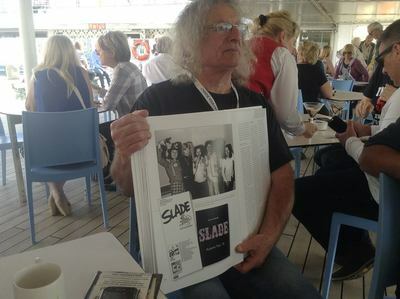 I then made my way to RADA on Chenies St - bumping into my old dear friend Bob Young - who was ‘Quo’s tour manager back in the ‘70’s when Slade and Quo toured together a lot. We walked to John Pidgeon’s memorial service. Many of the Barnes lunch goers were also there (but not Nod ???). Bob, Ed Bicknell and myself sat together for the ‘cabaret show’ for dear John. The last thing at the service was, Tom McGuiness (ex-Manfred Mann & McGuiness- Flint) singing McGuiness-Flint’s big hit” When I’m Dead And Gone”. Quite SAD - but it was a lovely ‘send off' for dear John. 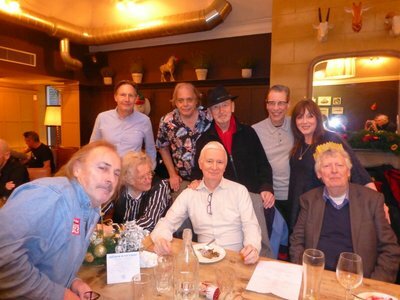 After the Memorial Service, Ed Bicknell, Bob Young, myself and Sandi (who used to be married to Ian Mclagan, keyboard player from The Faces) all went to a have a pizza. 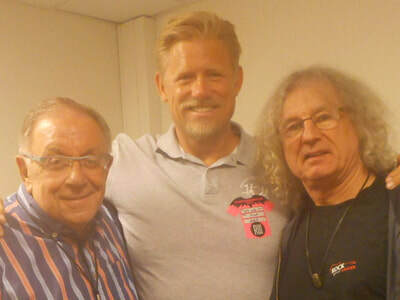 Bob and myself were telling, Ed and Sandi about Slade and Quo's touring days together - especially having Police escorts during internal flights on our Australian tour together in 1973 - along with food fights, stripping off and walking round the plane - mind you the other passengers loved it!!!!! We said our cheerios saying ‘See you all next week for the Barnes Lunch'….. I only had a small breakfast (cause of the impending lunch). Made my way to Piccadilly Circus to go DVD shopping in ‘Fopps’ All I got was the new CD with Christine McVie and Lyndsey Buckingham together… ( from Fleetwood Mac). I was sitting on the steps around the EROS statue (the fountain wasn’t on!!!) with a cup of, tea when a lady came up for my autograph saying,:“ You’ll soon be singing that song again.” I looked at her puzzled - and then realised that of course she meant ‘Merry Xmas Everybody’! I then got as far as Hammersmith by the underground system - I was wandering around the bus station being sent all over the place for my bus to Barnes….. When I bumped in to Clem Cattini (session drummer from the ‘60’s who’s played drums on over 200 Hit records, 55 No 1’s. WOW.!!!) He was confused as well - as he always uses this route. We eventually found the right bus and got to the luncheon venue - we were one of the first to arrive anyway! Suzi and Rainer arrived shortly after… Nod also arrived at the same time. I sat on a table with Gillie Coghlan (wife of original ‘Quo’drummer John - he was left at home, dog- sitting!) Tom McGuiness, ex Manfred Man and McGuiness Flint guitarist and Norman Jopling (writer) who was telling me he saw Slade at the ‘Academy Of Music’ in New York in 1972 - supporting the J Geils Band.. Also, Bruce Welch from The Shadows was telling us all how they (with,Cliff Richard) toured the, States in the late’50’s travelling round the US with Dion & The Belmont’s / Frankie Avalon using Greyhound Buses!……. A lovely afternoon as usual - when most of the, guests had left, Ed Bicknell, Chris Charlesworth and a few others were mesmerised at some funny Slade on the, road stories being told by Nod and myself….. I said my goodbyes and made my way back to my hotel. It was pouring with rain AND I got soaked to the skin (bloody summer)…. I was in bed, 21:00… WONDERFUL DAY. I went to baggage claim on arrival, anticipating no suitcase. You can imagine my relief when it came round on the conveyor belt….. I know lots of people missed their connections to Toronto, New York and China….. The promoter met me at Zurich Airport - we drove about two hours to our hotel to pick Robin and Tim up to go to the gig to sort the equipment out…. We left for the gig. It was a great crowd AND they stayed in spite of the pouring rain. It was an open air show to about 1,000 people…. We got back to the hotel after an early show, we all had something to eat and drink. I was in bed, 22:15. I was up 06:00. Cleaned up and went for, breakfast…. I got my things together and went to the gig ( Nr. Graz). I met Pete Agnew ( riginal bass player from Nazareth) there - he is the only original member left - his son, Lee, now plays drums. Daryl Sweet, original drummer, died some time ago. Pete and myself had a nice chat about working together - Nazareth & Slade -during the ‘60’s. We had a great open air gig - played to about 2,000 people…. We drove back to our hotel more or less straight after we finished. Cleaned up and went for tea. Everyone else was there having breakfast. I relaxed before going to the gig with Tim and Robin. Very well organised, I stayed there the whole day. The others came for our sound check. We had a, great open air gig to about 2.000 people. ‘H’, Mal and myself came back to the hotel. Mal and myself had a drink together. Cleaned up, packed my case and went for breakfast. Suzanne drove me to Dusseldorf Airport - to find my flight to Frankfurt (aargh) had been cancelled ????? At least I didn’t have to race around being pushed and shoved as is the norm at Frankfurt Airport (argh)………. I flew to Brussels, our driver met me. Mal arrived, then ‘H’..
We drove about an hour to Leper - checked in our hotel. I unpacked and went for a walk round and had something to eat in town. We all went to a Second World War Memorial and met a few of the town's dignitaries. I stayed in bed ‘till 10:15. Went downstairs to see what was going on. I walked to the gig… The crew were still building the stage. I spent all afternoon at the gig. Had a great open air show to about 3,000 people. I was up at 07:00. Cleaned up and finished my packing. Made my way to the airport to fly to Berlin Via Amsterdam.Nice flight to Amsterdam - amazing how big Schiphol Airport is now. Back in 1971 ‘Get Down And Get With it’ was a hit in Holland before the UK - and we were flying to Amsterdam nearly every week for TV shows - Schiphol was only one small building then….. I then flew to Berlin. The promoter was waiting for me, H arrived just after. We were driven to Lubbenau / Spree…. Checked in our hotel - everyone else was there except Mal.I found out my nephew John and his wife have had a little boy Oliver……. I stayed in bed ‘till 09:30. Cleaned up and went downstairs - had tea with Robin beforeTim, Robin and myself left for the gig. We had about an hour’s drive - we set all the equipment up. The others arrived so we could do our soundcheck. We relaxed at the venue. Had a great show to about a1,000 people in the town square.We all drove back to our hotel and had a, drink in the, hotel bar before I went to bed 01:30. I was awake 07:00am went to the fitness centre for my usual session. I left for the airport to fly to Oslo. Spent time in the lounge before my flight making sandwiches for the day. When I was going through security the ‘sniffer’ dog made a move on me sniffing around - he didn’t stay long, must have been the old socks I was wearing……. Ha. My flight was delayed an hour - I let everyone know. I eventually met Suzanne and Mal at Oslo airport. We had a short wait for the others to arrive. We all drove to Fredrikstad. Checked in our hotel - I relaxed in my room and was in bed by 23:00. I stayed in bed ‘till 09:45. Relaxed in my room before walking to the gig via a short river ferry…. We had a, great show to about, 1000 people. Got back to the, hotel and was in bed by, 00:15. Cleaned up and packed ready to fly to Bodo first then,another flight to Svolvaer. Drove to our hotel, checked in. I went to the gig with Robin and Tim to sort the equipment out. Came back to my room to clean up. Found out H had moved hotels (something he does nearly every day on tour). Had a great show to about 2,000 people. I watched a bit of 10CC before going to bed, 12:00 midnight. I was awake at 07:00. Checked out of the hotel to drive to Haarstad and fly to Oslo - then to Copenhagen (to go to the Robbie Williams show at the National Football Stadium). I had a message from Pete Williams (Robbie’s Dad) to tell me their hotel details and what rooms they were in). Our dear friend Marianne met me - we then caught the metro system to her place. I then made my way to Robbie’s hotel to have tea and biscuits them….. Spent time having a great reminisce…. I got back to Marianne’s around midnight. Hanne, Marianne and myself got ready to go to the Robbie Williams concert at the National Stadium in Copenhagen. When we got there, I gave Pete (Robbie’s Dad) a call. He came out to meet us with our passes etc, and to take us through to the backstage area. When we got there, Robbie was doing a filmed interview BUT he stopped it and came over to welcome me with a big hug. I then told him to go back to work. We (family and friends) were greeted SO warmly, everyone made us SO VERY welcome. Just before it was time for Robbie and his band to go on stage they all got into a circle for their warm up ritual. 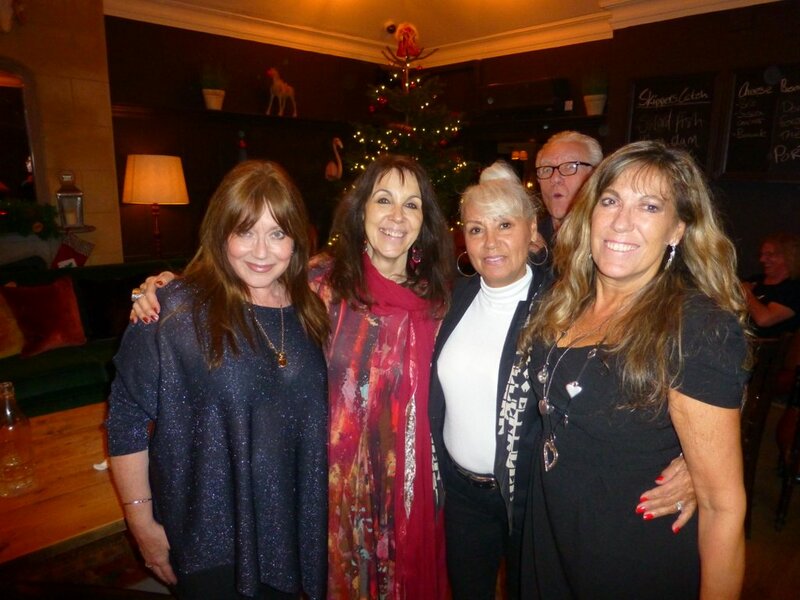 Robbie insisted that I get in their circle and join in with them……. 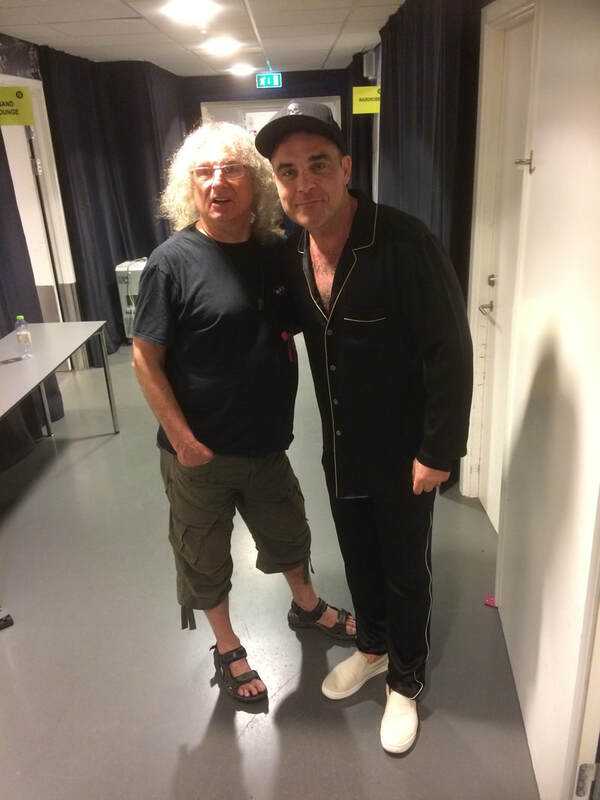 We said our goodbyes to them as they went on stage - as afterwards Robbie and the band would drive straight to the airport to fly to Finland…..
What a fantastic show AND how warm and welcoming they all were to all of my family and friends….. I met everyone at Stansted Airport as arranged. Drivers met us and we had an hour’s drive to Chaunay in France. Checked in our hotel and I relaxed in my room. Tim and myself texts each other a few times to sort out a schedule for tomorrow’s gig. I was awake, 08:00. Cleaned up. We all met for breakfast, Robin and myself went to the gig together. Jill from “ Louder Than Words” came with her husband. 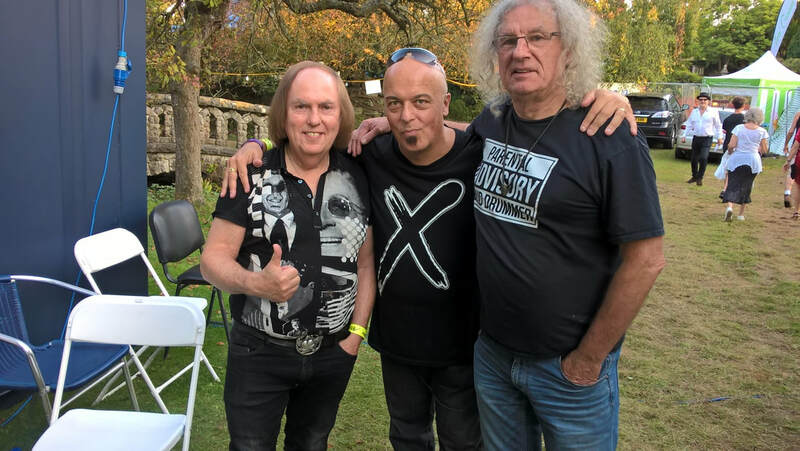 We had a nice few hours together just talking ‘bout anything…..
We had a, great show to about a 1,000 people outdoors It reminded me very much of the place were Andy Scoot organisers the “ Rock Against Cancer “ gig. I got all my things together to meet the others at Copenhagen Airport so we could drive to Sweden. We had about a four hour drive to our hotel in Nassjo. I told Robin I would not go to the,gig with,Tim and him in the,morning. Checked in my room and. Was in bed by 00:45. Cleaned up and went for breakfast Everyone was there. We all left for the gig……….. We had a great early show to about 6,000 people. I was up at 06:00……..
Made my way to Gillingham to check in our hotel. Spoke to John Berry, he would pick me up later to go to the gig to check our equipment out. Before we left, I checked my lotto ticket, the guy in the shop said, it looks like a ‘biggy’ mate. When I did check it properly. I found out I'd won a free lucky dip for this Wednesday……..( once again, false hope). It was a great open air setting to about 3,000 people. Great weather AND a great gig. ‘H’, Mal and myself drove back to our hotel - I was in bed by 22.30. I was awake at 04:15 (before my alarm 05:00). Cleaned up and finished packing to meet Suzanne for, breakfast. Robin, John and Graham (our road manager) arrived so we could all drive to Newcastle Upon Tyne together so we could check into our cabins on the MAGELLAN ship - our home for the next four days! Met Tom McGuiness from Manfred Mann (he is also a regular at our lunches in Barnes) and the Troggs. We all had to have a safety demonstration - in case of an emergency on board! And H can't swim! ​Also it was great to find out that our old roadie, Will, and friend Janet were onboard! I spent a great deal of time reminiscing with them. I made myself-familiar with the boat (very big). I watched a bit of the Troggs play. Met an American couple, Eric and Tracey who’d travelled all the way from New York to see us play! They were big fans from the ‘70’s……. Also dear friends Glenn and Gwen were also on the trip…. Went to a restaurant to have breakfast. I then went to the gig to sort my drums out. The others turned up so we could do our soundcheck. I went for lunch before watching, Manfred Mann. Rob Townsend was on drums for them, he used to play with the group ‘Family’ (he also goes to the Barnes lunches). Mike D’abo was singing (he replaced Paul Jones in the ‘60’s). We left Newcastle to sail all round the Scottish Coast. Manfred Mann went on before us. We had a great full gig. Last time we played a similar boat trip from Sweden, it was a very bumpy trip AND I threw up all over my drums! Not a nice spectacle when I hit my drums - everything was sent ‘spraying’ into the air!….. Ha, should have got a photo! Tonight, we went on before the Manfred’s…. Another great show. I flew to Brussel’s and met H, his wife Jan and Mal. We drove to the festival site to get something to eat before checking into a very nice hotel. I just relaxed in my room and was in bed by 20:00. Cleaned up and made tea before meeting everyone for breakfast. I went to the gig early to sort my drums out and to do our sound check. We all went to eat together before I went back to the gig with Tim and Robin. Had a great gig to about 3,000 people. At the end of the show, our great friends from Belgium, John-Louise and his wife Brigitte, wheeled on a massive cake made like a drum and all the crowd sang ‘Happy Birthday’ to me…. We all got back to our hotel where I shared the cake out (I had the biggest piece). I got to Brussels Airport, carrying what was left of my cake. Security did a stringent check on it, before they all shouted ‘Happy Birthday’ and told me to ‘clear off’ !! When I got home, Hanne had invited her Mom and her partner and her Father over…… We all ate what was left of my fantastic cake from Belgium!. I woke at the Radisson Hotel at Stansted Airport at 07:30. Made tea in my room before cleaning up, went for a late breakfast. We drove to, Lincoln. It was an open air show to about 1,500 people. We had a great show, we went on after the Bay City Rollers……. Tour manager Graham drove us to stay at a Premier Inn in Scunthorpe, I was in bed by 00:50. We checked out of the hotel. Graham dropped me at the station for me to get the train to Manchester. Met session drummer Tony Cannelli on the same train - he came over talking, he was going to the same show. We made our way to Manchester Central together. Met Craig Fenney who owns the ‘Music Shipping Co.’ he supply’s my sticks for me (and lots of equipment). 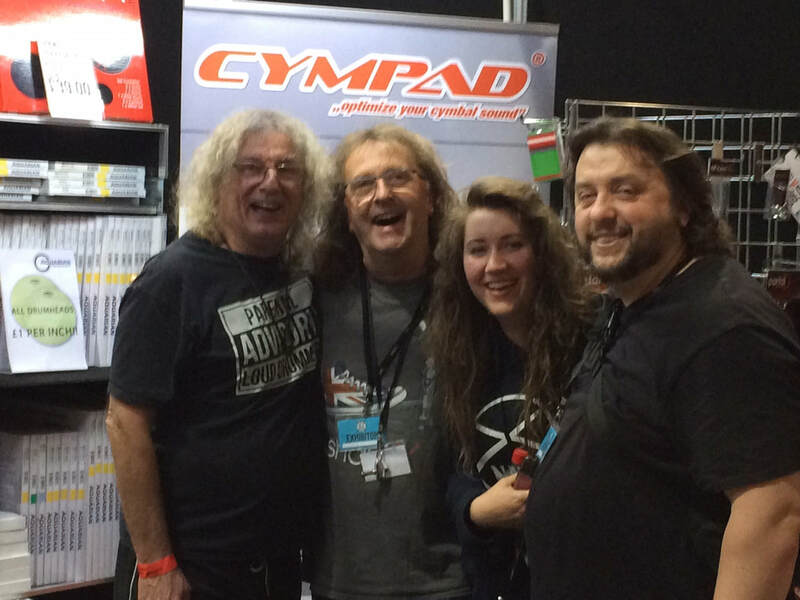 Had a great afternoon meeting lots of people I know and deal with from Ludwig, Zildjian cymbals, Aquarian Drum Heads……. 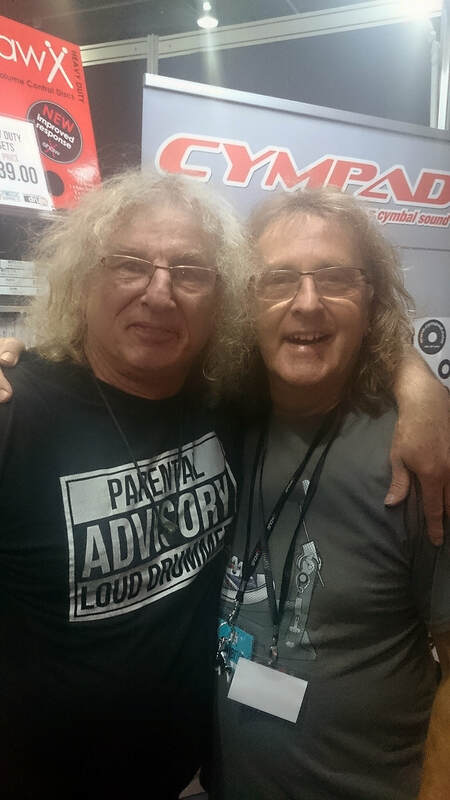 ​Terry McCusker, dear friend and drummer from Liverpool (he used to play drums with ‘Bunny’ and ‘Colonel Bagshot' (bands that Chas Chandler signed up during the ‘70’s - and they toured with Slade in Europe and the UK). A great end to the day was watching Simon Phillips play at a drum clinic. Made my way to my hotel and was in bed by 21:00. Hanne, myself and our dear friend Marianne had a 90min drive to Aabenraa. 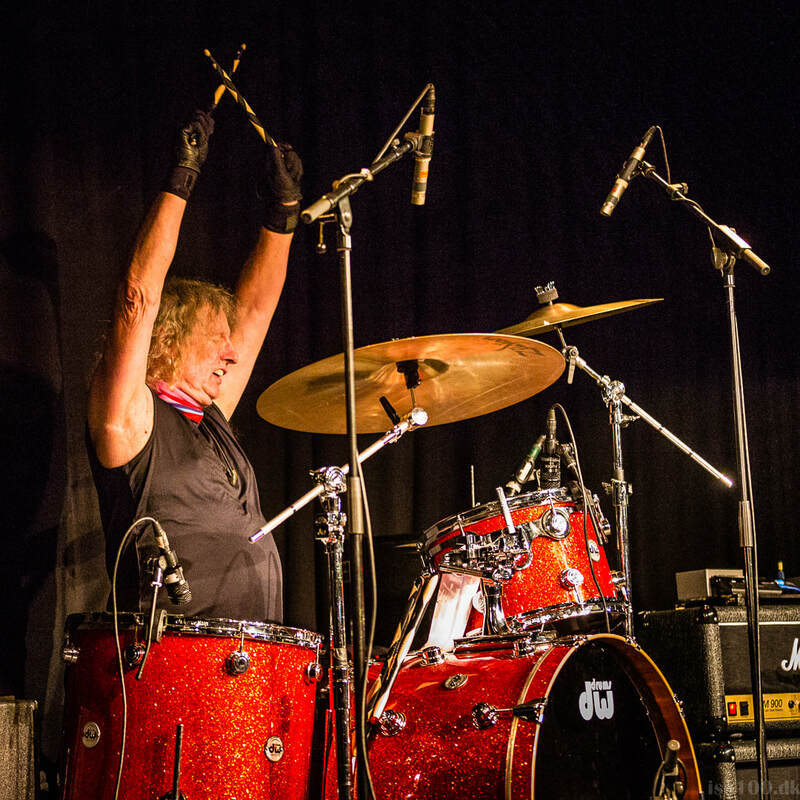 We went straight to the gig to sort my drums out… Robin, Brendon (on loan from Smokie as our toadie Tim was away with The Hollies) were there. We did our soundcheck, relaxed and ate at the hotel before a great show to about 500 people at a brandnew rock venue called ‘Gazzaerket’. Hanne, Marianne and myself drove back to Silkeborg…. I went early to the Kedelhuset in Silkeborg to sort my drums out. Went to eat with everyone at the Radisson Blu Hotel in Silkeborg (where they were staying). We had a great sold out show to about 500 people. Apparently people outside were trying to buy tickets from people for exuberant prices. I had lots of family and friends there. Bent, the promoter, was there. He invited Hanne and myself to any of his shows that he promotes………. Went straight to the gig (at a big hotel complex), We also played here last year….. I set my drums up - we did our sound check. We had a great show to about 500 people. Torben, the promoter for this show, was also there. Hanne and myself drove home for a reasonably early night. Checked out of the hotel and was driven to Paul's house for lunch. Made tea before cleaning up. I relaxed, John called back to say, they were stuck in traffic. I made my way to the gig..
Met all the PA guys before Jon " Now Hire" arrived..... I sorted my kit out before the others arrived to do a soundcheck. Got back to our hotel,. I was in bed by 11:30. Packed my case and went for, breakfast. We checked out of our hotel and drove to, Guildford. Robin and Tim went straight to the gig. I checked into my room before making my own way to the venue. After I'd sorted my drums out, I stayed at the gig. I did some book signing AND sold all my books! Amazing. I am hoping to get some for the Xmas UK dates and do the same again. 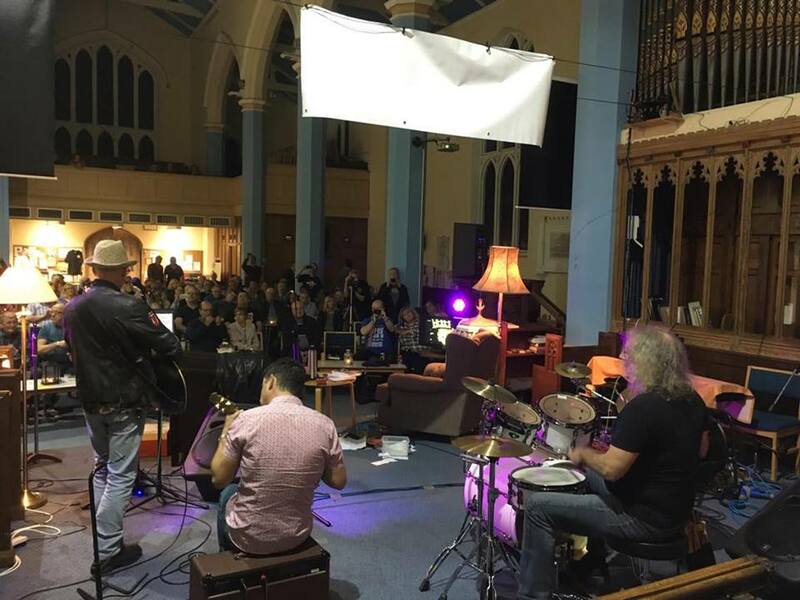 We had a, great gig to about 300 people. I was awake at 05:30! Made tea and packed before cleaning up. Went for breakfast before we drove to from Guildford to Kings Lynn. I was awake 07:00 before my alarm went off. I made contact with Andy Richardson from the Express & Star in Wolverhampton. Said that we'd speak later. Spent all afternoon at the gig here in Worthing (my old hunting ground). 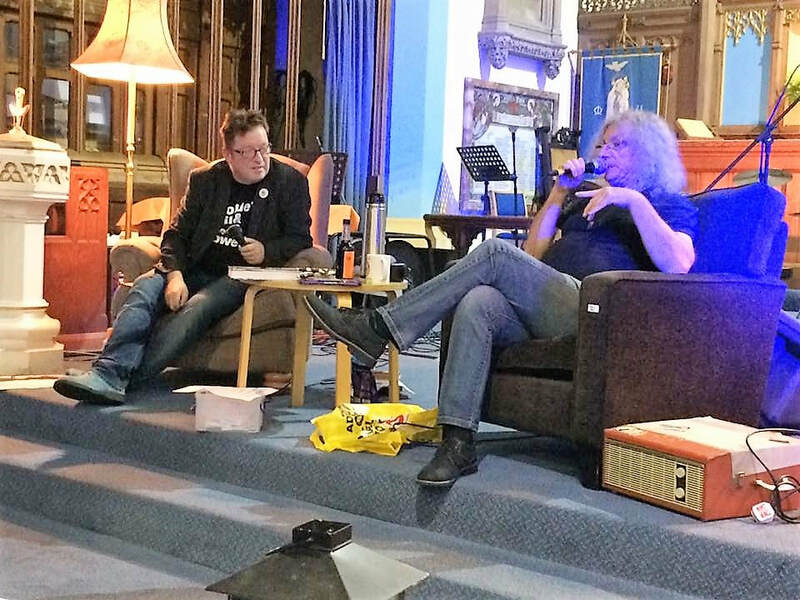 We did our soundcheck and relaxed before sitting with Suzanne selling my biography at the merchandising stand…. When Mud went on stage - I went back to the dressing room to relax before our show. We had a great first show of the Xmas tour everything went SO well - lovely feeling. Martin & Sally (old friends from Wolverhampton) were at the gig). I checked into my hotel and was in bed by 11:15 - that’s one good thing about being on a UK tour - at least you get a, reasonably early night. Cleaned up and packed and went for breakfast before driving to Nottingham…. 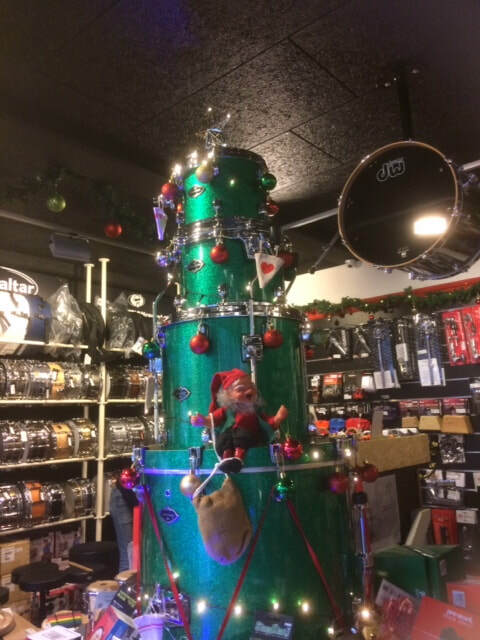 I went straight to the, gig with Robin & Tim to sort my drums out. I stayed there. We had another great show to about 300 people - including my old friend Richard Cox who came along to see the show. 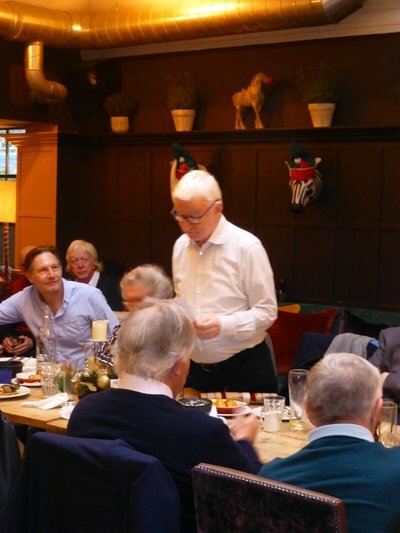 Lars Daneskov (DR journalist) who “Interviewed Don at the Q&A Dinner with Don in Copenhagen on 22nd November . Photo: Marianne Jensen. I was awake at 08:00. Cleaned up and went for breakfast before going to DR to record a radio interview with top Danish presenter Jorgen De Mylius…. 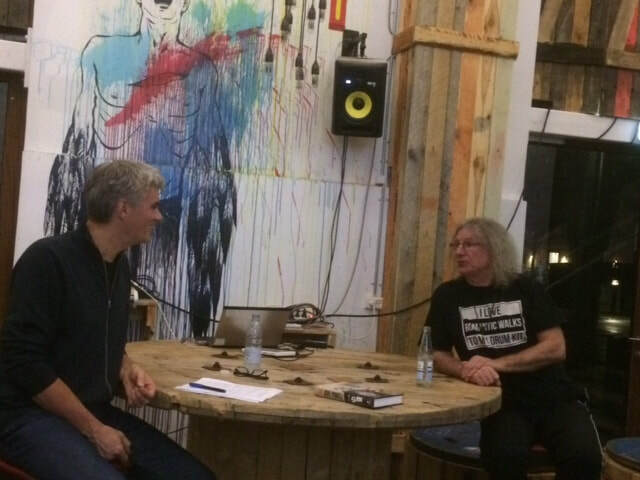 Great interview he’s SO knowledgeable about music…. From there I went to have a look at the music shop Andreas works in. Came back to our hotel to have tea and a sandwich before making my way to the gig Amager Bio - where we are playing tomorrow. I did another interview over a dinner with people asking questions. 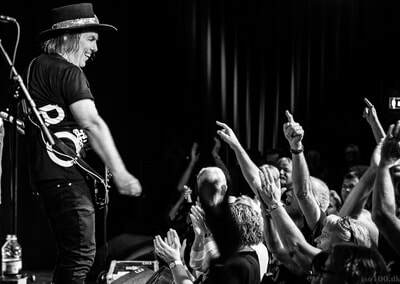 From there I went to watch a bit of Little Stevie’s (Bruce Springsteens’ guitarist) solo concert….. I stayed at the gig….. Great show to an almost sell-out crowd 900 people…. I sold lot’s of my biography’s before and after the gig….. Went back to our hotel - Robin was still up - also promoter Thomas Helmig. We had a drink with him before I went to bed 23:00. I stayed in bed ‘till 10:00. Cleaned up and made tea in my room. Went for breakfast before going back to Andreas’s music shop “4 Sound” to record a message for their chain of shops all over Scandinavia. I stayed in bed ‘till, 09:30 - made tea. H called to say our crew are not wanting to drive at night on the upcoming UK tour ????????????? Sorted my equipment out before our soundcheck, Had a great show to a sell-out crowd. I walked back to our hotel with H and his wife Jan. I got up when my call came through at 09:00. I cleaned up and packed, checked out of the Radisson Hotel, Stansted Airport to drive to Vauxhall Holiday Park. We checked in our hotel near the site.... Went to the gig to soundcheck, stayed there. Had a great show. I got to bed at 01:00. I was awake at 04:45, cleaned up and packed. Met everyone for breakfast. I gave my laundry to John Berry to sort out for me! Made my way to my hotel in Hammersmith, went out to eat before having an early night. I spoke to Andy Scott who said he wasn’t feeling good and wouldn’t make it to the lunch today in Barnes. We had a great afternoon. Suzi Quatro and her husband Rainer were also there. 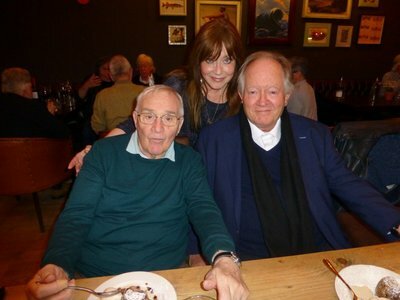 I sat with John and Gillie Coghlan. I managed to get an earlier train to Sheffield. Checked in my hotel and went shopping. Won £3:00 on the, lottery!?????? Came back to the hotel to relaxe before eating there.... (too cold to go out). I went to bed..... 21:30.. I was awake at 09:30. Made tea before cleaning up. From there I went to the gig to sort my drums out - spent the afternoon there. Good gig to a few hundreds people, Sold a few books at the show - before and after. Came back to our hotel and was in bed by 23:15.. I was awake before my alarm went off 08:00. We then drove to Wakefield. Checked in our hotel. I had tea with Mal. We had a great show - sold lots of, books. Stu told me he’d arranged for me to play the Otis Reading Classic song ‘Mr Pitiful’ with the Otis Reading Band on a TV show.. I got up when my alarm went off at 07:00. Cleaned up and packed to go for breakfast. I then drove to Norwich with Robin, Tim and Suzanne. From there I went to the gig to sort my drums out. Great gig to about 300 people..... Sold lots of my Biogs.. I relaxed in my room before going to Mick's ‘One Stop Music’ shop in Wolverhampton. 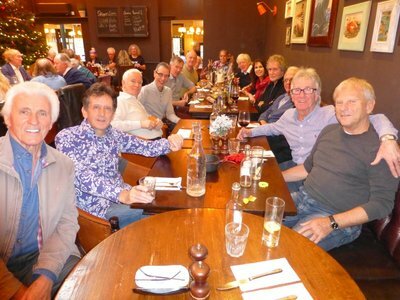 I had a, great day meeting my old school friends from Etheridge Secondary Modern Boys School. A reporter and photographer were there from Wolverhampton’s Express & Star newspaper, lot’s of photos were taken. I then did a radio interview with a Manchester radio station Canal Side Radio to promote our Manchester show at the Academy 2 on the17th December. SAM FM were the first to call promoting the Salisbury gig on the 14th. Sandgrounder radio were next to promote Liverpool on the 22nd..
Mike from One Way Music called to say my photo was on the front page of Wolverhampton’s ‘Express & Star’ - also an article inside. Geoff from, Manchester North radio called for an interview to promote Academy 2 in Manchester on the 17th. Then Radio Yorkshire to promote Hull on the 23rd.... Hull Kingston radio then also called for an interview. I then had a couple of hours break - and went to post some more Christmas cards and one of my Biogs to Amanda Thomas, a concert promoter in Australia. Came back to my room to carry on more interviews. Jon Jessore from, Coast FM called to start the afternoon interviews off promoting Liverpool. Phil Kennedy for Radio Berkshire was next and last interview. I was awake at 08:30 before my alarm went off. Had a great show to a sold out crowd. Tich, John and Beaky were there from Dave Dees band were there. I was awake 08:00 before before my alarm went off. Cleaned up and packed . Went for breakfast then drove to Bilston. Checked in our hotel and relaxed. 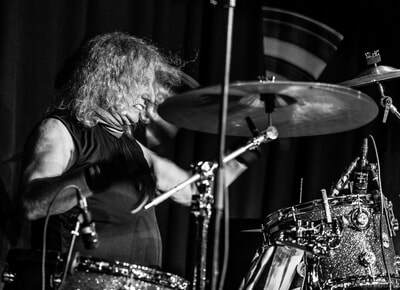 Paul Burgess (drummer from 10CC) called to swap his night from tomorrow to tonight..
Great gig to a sold out crowd. I had tea at our hotel with Terry (Colonel Bagshot) his lady Christine and Alan Lynch (old Slade roadie). I went to bed 00:30. I was awake 08:00 before my alarm went off at 09:00. I cleaned up and packed went for breakfast. Before driving to Manchester. Checked in our hotel and relaxed. Rob and myself had tea together before going to the gig. Came back to our hotel and was in bed by 11:30. Got up when my alarm went off at 07:00. I gave John Berry my laundry to do for me. ‘H’ and myself caught the train for a short journey to Wolverhampton. Brother Derek picked me up to have something to eat with him and Chris. We then went to see Sweet at the Robin. Lovely evening, all the guys made us feel SO welcome. I was in bed by 11:30. Spent all day with Derek and Chris. Wrote some diary pages for Dave then cleaned up. Walked into town and got some more DVD’s + CD’s…. Brother Derek and his wife Chris picked me up - we spent a few hours at Mom & Dad’s grave…. We also found Granny Caroline's grave - she died in 1962 - cousin Dave is buried with her…. Popped to see sisters Carol and Mash. I was up at 08:00 - made tea and cleaned up. Checked out of the hotel and met ‘H’ at the rail station to get the train to Oxford. Great show to a sold out crowd. I was in bed by 23:10. Got up at 08:45 - cleaned up and packed to drive to Liverpool. I went straight to the gig to sort my drums out. Great gig - Lou from Export and Brian from Colonel Bagshot were at the,gig. Great sold out last gig. ‘H’ and myself came straight back to our hotel. I came straight to bed…..